The euro is trading down against the US dollar for the second day in a row, extending its rejection from the 1.1715 area on August 30. Risk off and concern about the viability of a Canada-United States deal are the problems. 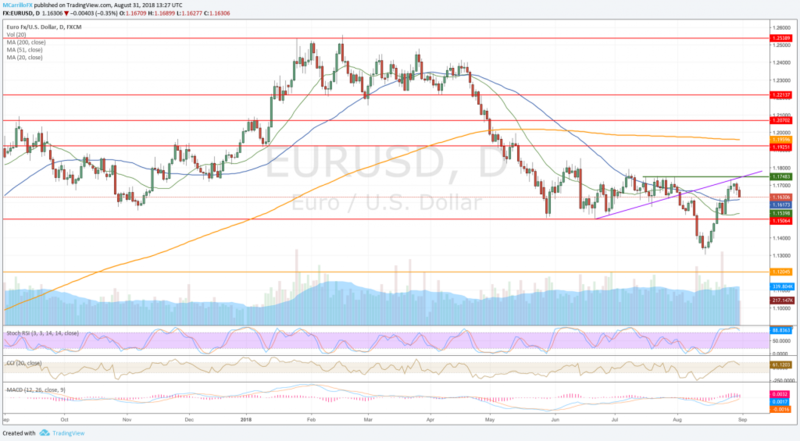 EUR/USD is trading 0.35% down at 1.1630 on the last day of the week as investors are not that interested in the euro due to concern on trade conflicts. The market is worried about how the United States will sign a new deal with Canada on Friday and what would be the implications with Mexico if the deal isn’t reached. In this framework, the risk aversion is over the table today, plus Friday’s closings and profit taking would make the market turn around and push riskier assets down. In this case the Euro. Technical conditions for the EUR/USD are fading as the pair remains overbought while MACD is turning neutral to negative. Moving averages are becoming more northbound, but it is too early to say it. Check for the 50-day moving average at 1.1615 for the first support, then the 20-day moving average at 1.1540.